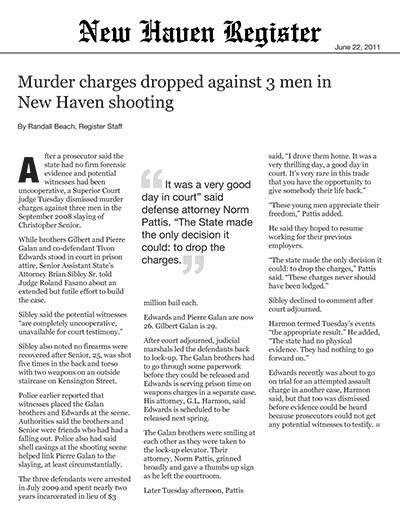 After a prosecutor said the state had no firm forensic evidence and potential witnesses had been uncooperative, a Superior Court judge Tuesday dismissed murder charges against three men in the September 2008 slaying of Christopher Senior. While brothers Gilbert and Pierre Galan and co-defendant Tivon Edwards stood in court in prison attire, Senior Assistant State’s Attorney Brian Sibley Sr. told Judge Roland Fasano about an extended but futile effort to build the case. Sibley also noted no firearms were recovered after Senior, 25, was shot five times in the back and torso with two weapons on an outside staircase on Kensington Street. Police earlier reported that witnesses placed the Galan brothers and Edwards at the scene. Authorities said the brothers and Senior were friends who had had a falling out. Police also had said shell casings at the shooting scene helped link Pierre Galan to the slaying, at least circumstantially. The three defendants were arrested in July 2009 and spent nearly two years incarcerated in lieu of $3 million bail each. Edwards and Pierre Galan are now 26. Gilbert Galan is 29. After court adjourned, judicial marshals led the defendants back to lock-up. The Galan brothers had to go through some paperwork before they could be released and Edwards is serving prison time on weapons charges in a separate case. His attorney, G.L. Harmon, said Edwards is scheduled to be released next spring. The Galan brothers were smiling at each other as they were taken to the lock-up elevator. Their attorney, Norm Pattis, grinned broadly and gave a thumbs up sign as he left the courtroom. “These young men appreciate their freedom,” Pattis added. He said they hoped to resume working for their previous employers. Sibley declined to comment after court adjourned. Edwards recently was about to go on trial for an attempted assault charge in another case, Harmon said, but that too was dismissed before evidence could be heard because prosecutors could not get any potential witnesses to testify.